What fun it was to be at the European SharePoint Conference last week in Dublin, Ireland! With many interesting sessions, speakers from all over the world, a wide range of sponsors (including Crow Canyon! ), and some great “social events” at the Jameson Distillery and Guinness Storehouse, the conference was a rousing success. We had a chance to meet several of our European customers as well as many new people. Being from the United States, where there is one language and more-or-less one culture, it was quite interesting to talk with IT people from many different countries. The European Union has 28 member countries, each with its own language, culture, and history. The conversations we had helped us better understand the business environment and challenges of these many countries. Even though there was quite some diversity in the attendees, the focus was on SharePoint and Office 365. The use of technology extends across cultural barriers and the same basic principles apply – companies are seeking ways to run their operations more effectively and efficiently. That means higher profits, better service to customers, and easier work for employees. 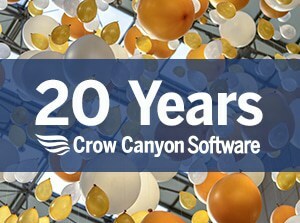 That is what Crow Canyon has set out to do with its SharePoint and Office 365 applications. Regardless of what country a company is in, the end goal is the same — better use of SharePoint and Office 365 to improve operations. In almost every conversation, we could find common ground to address the concerns of the SharePoint admin, manager, or developer who came to speak with us. We look forward to working closely with partners and directly with companies in Europe to help them achieve more with SharePoint and Office 365. We hope to see many of you at the European SharePoint Conference in Copenhagen next year!